You have to give credit for first-year Arkansas coach Chad Morris for not making excuses after the Razorbacks’ 34-27 loss last Saturday at Colorado State. He stood firm on the podium Monday at his weekly press conference, accepted the blame, and said his staff would work toward fixing the issues that allowed a 27-9 third-quarter lead dissolve into a disheartening loss. It reminded me of the attitude legendary former Razorback basketball coach Nolan Richardson had after losses when he would say the players get the victories, and I’ll take the losses. Richardson’s program had growing pains in the mid 1980s when he took over the team from Eddie Sutton; however, step by step Richardson and his staff, that included current Razorback head basketball coach Mike Anderson, built the Razorbacks into a national powerhouse from 1989-1996. Don’t get me wrong. I’m not saying Saturday’s agonizing loss to the Rams was anything but a loss, but it does take a confident coach with character to plant his feet, accept responsibility, and not publicly cast blame on the players, who obviously did not perform up to standard against Colorado State. Behind closed doors, I’m sure the Razorback coaching staff made it abundantly clear to the players on exactly how they must improve to avoid another fourth-quarter meltdown against a less talented team. The loss was irksome and all too familiar to Razorback fans who saw leads melt away under the previous staff. While Morris’ style of football is at the other end of the spectrum compared to former Hog coach Bret Bielema, there are some fundamental truths to the game that style and philosophy can’t mitigate. One of them is that it takes more energy and effort to play defense than it does offense. Force a defense to play too long, and it will tire and become less and less effective no matter how much a coach substitutes. The Razorbacks’ offense ran just eight plays in the fourth quarter and just 26 in the second half, compared to 49 in the first half. Both of Arkansas’ third-quarter scores were on quick drives that came in the first eight minutes of the second half. Colorado State blanked the Razorbacks from that point, while going on to score three touchdowns and a field goal. It’s difficult to say how Colorado State shut off the Razorbacks’ water so quickly? Arkansas did have chances at points after T.J. Hammonds’ 64-yard TD reception off a behind-the-line-of-scrimmage pass from quarterback Cole Kelley. Morris said the Razorbacks did not handle their early third-quarter success very well, alluding to a lack of focus after building a three-touchdown lead. It’s hard for young teams not to take a breath when they get a lead, but with today’s brand of football no lead is safe when two relatively even opponents are playing. 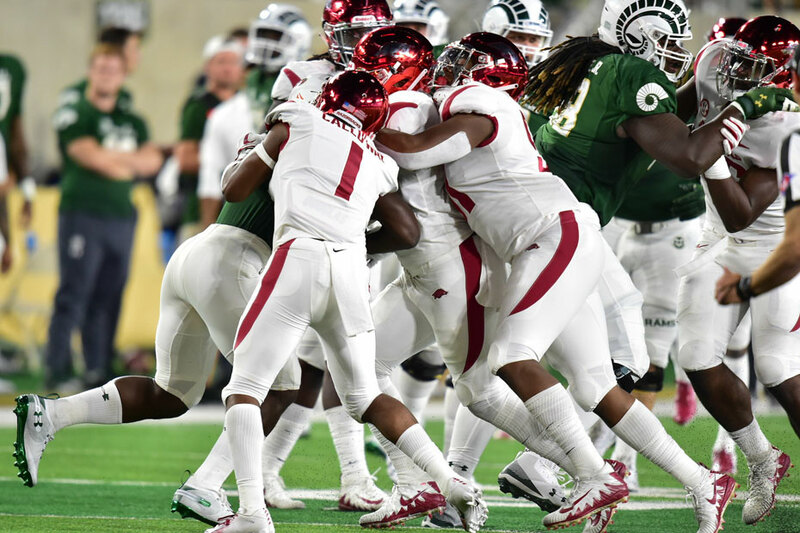 The longer the defense had to rush the passer, the less effective it became, giving Colorado State’s long tall receivers Preston Wilson and Cameron Butler more time to shake loose from Arkansas’ defenders. Arkansas defensive backs couldn’t stop them, and with little help from the offense there was no relief. Football today is a marathon rather than a sprint. More and more it is like basketball where leads aren’t ever safe. The old idea of getting ahead and salting away a lead with the running game only works if you keep scoring points. Right now, Arkansas’ quarterback situation makes scoring points difficult. Ty Storey is more smooth running the offense, but his inaccuracy at passing becomes more and more of a liability as the Hogs face better talent. Cole Kelley has a stronger arm, but his decision-making and his overall ability to operate the offense isn’t where it should be for a starter in the SEC. After watching the first two games, it’s easier to understand why it took so long for Morris and his staff to decide who would start the first game. Going into Saturday’s 3 p.m. game with North Texas, it’s anyone’s guess which one will start. Of what I’ve seen, I’m thinking Storey gives Arkansas a better chance to sustain drives, but I fear an interception nearly every time he passes. Kelley can make the throws, but often he’s choosing to throw to a covered receiver when others are open, and he’s just not as capable of a ball handler in the running game as Storey. Arkansas offensive coordinator Joe Craddock said Monday that Connor Noland is the third-team quarterback. Some are calling for him to play if not start, now. It’s hard for anyone outside the team to know how close Noland is to being ready to play. He may be on the cusp, or it may be out of the question. With Storey and Kelley needing so much work, Craddock said that quarterbacks behind them have not gotten a lot of work the last two weeks. With that information, it would seem Noland and the other freshmen QBs aren’t in the plans at the moment. With off-campus games at Auburn and at Arlington, Texas, against Texas A&M looming the next two weeks and then Alabama visiting Fayetteville the first week of October, this really isn’t the time to be thinking about throwing a freshman to those kinds of wolves unless injuries force it to happen. That said if the play at quarterback doesn’t even out, grooming Noland has to be a thought for down the line? As for Arkansas’ defense, I think they are playing better than in the past two seasons. They are aggressive. They run to the ball and tackle a bit better. However, unless the offense can find a way to be more consistent in scoring and possessing the football, it’s going to be bombs away for the secondary all year. Everyone knew this was going to be a tough season when Morris was hired last December. The hope that comes with a new season may have blinded some of us for a moment, but the outcome of last Saturday’s game made reminded us exactly why athletics director Jeff Long and Bielema were let go last year. It is going to take time for Morris to rebuild the program as he says he can. This Saturday is going to be a battle with North Texas, which has the most prolific passing offense on average in the nation. There’s not much fans can do but cheer and attempt to make Reynolds Razorback Stadium an imposing venue for the opponent. That could be the difference in the ballgame on Saturday or not. When a team is unsettled at quarterback, there are no guarantees.